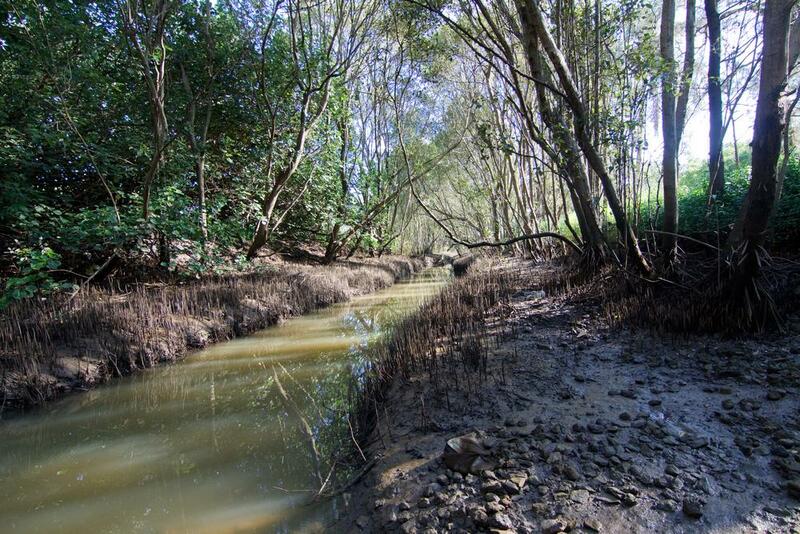 Toowong Creek: The Sole Survivor | There once was a creek . . . I was never quite sure how to go about investigating how Western Creek once was. About the only plan I had was to explore an existing creek, comparable in size and type, and consider how it might be similar to Western Creek. In particular, I wanted a creek that flows into a similar part of the river. I’m familiar enough with freshwater creeks: it’s the salty bits that I know nothing about. I thought I would have to cover considerable ground to find what I was after, given how few creeks of this size tend to have survived suburban development. But this afternoon, I had a nice surprise. Feeling a little guilty for being inside on such a perfect autumn day, I decided to go and have a look at Toowong Creek. For a few years I actually lived quite close to this creek, at Vera Street. But there it was a freshwater stream much like Ithaca Creek and others I have known. I’d never thought to explore it further downstream; I didn’t know that it even existed past Moggill Road. The mouth of Toowong Creek is not accessible via a public thoroughfare. Like much of this part of the riverbank, it is the sole province of those who live in the adjoining apartment blocks. Well, almost. There is a small driveway off Gailey Road, which, if you follow, will take you to the mouth of the creek. 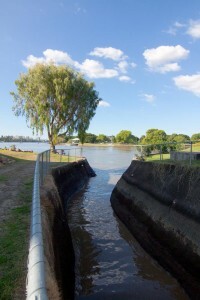 Its concreted channel is narrower than that of the Milton Drain. When a citycat passes by, the waves get squeezed in and slosh back and forth. It continues for fifty metres or so between the apartment blocks, then meets the culvert at Gailey Road and disappears. Heading inland, the creek continues underground for a couple of hundred metres, passing under some sort of light industrial site (can someone tell me what this is?). Then comes the nice surprise. It re-emerges at Perrin Park, not as an open concrete drain, but as a mangrove-lined creek! Is this how the lower part of Western Creek would have looked if not for the Milton Drain? Surely it can’t be too far off, at least in terms of quality of the water, the shape and texture of the stream bed, and the mangrove-dominated vegetation. But there’s something not right, and it hits you the minute you look out at the stream from the bridge at the bottom of the park. The stream is straight. It is every bit as straight as totally artificial Milton Drain, and in no way resembles the meandering shape of Western Creek as it was depicted on the early maps. 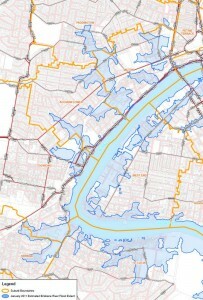 In fact, it doesn’t even resemble how Toowong Creek itself is drawn on those maps. 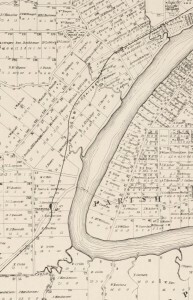 Take a look at the map at the top of the page, which shows the four creeks of the Crescent Reach. Toowong Creek is the one at the bottom, and there is barely a straight few metres in it anywhere. 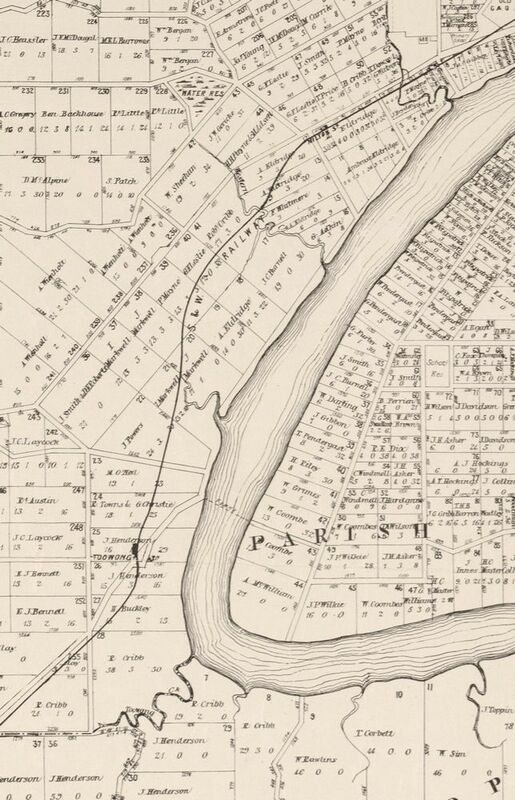 Strangely enough, even Google Maps depicts a winding stream, not quite as contorted as the one drawn in 1884, but sharing much more in common with it than with the dead-straight channel that exists today. So, despite my excitement, this isn’t really the Toowong Creek of old. But then what is it? Has this part of the creek been restored, having previously been a concrete channel? If so, it certainly shows what could still be done to restore some of Western Creek, say through Milton Park or Frew Park. Or was the channel instead straightened just to ‘reclaim’ some land, but never actually concreted? Someone out there must know! Even if the creek has been artificially straightened, it is still rather nice, and infinitely nicer than Milton Drain. As I followed it upstream through the park, I had one thing on my mind other than the shape of the stream, and that was the quality of the water. In thinking about the location of the chain of ponds that Oxley apparently discovered in Western Creek in 1824, I have assumed that Oxley couldn’t have found abundant fresh water in any part of the creek that received the brackish, tidal waters from the river. Toowong Creek provided my first, albeit very imperfect, opportunity to test this assumption. The tide was fairly low when I visited, so I couldn’t directly observe how far upstream the high tide would reach. I did, however, notice that the aerial mangroves roots that lined the sides of the stream bed disappeared as I neared the upper end of the park. Putting my life on the line in the name of science, I decided to taste the water. Sure enough, below the ‘mangrove line’ it was not quite fresh, even where the water was running. You could probably drink it if you had to, but in any other circumstance you’d choose the water from just a few metres upstream, where it was perfectly drinkable. The transition point, from what I could tell (and I didn’t want to drink more of the water than I had to! ), was about 150 metres downstream from where the creek flows under Burns Road. One of the first things I did when I got home was check to see how this compared to the ‘mangrove line’ of Western Creek. On the basis of historical references in The Brisbane Courier and elsewhere, I believe that the tide reached at least as far as Gregory Park (previously Red Jacket Swamp), and possibly further. The distance from the river to Gregory Park is about 1 km, yet the distance from the mouth of Toowong Creek to the mangrove line in Perrin park is not even half of that. So unless one of my deductions is very wrong, the gradients at the lower part of these two catchments are different: Toowong Creek must be steeper than Western Creek. 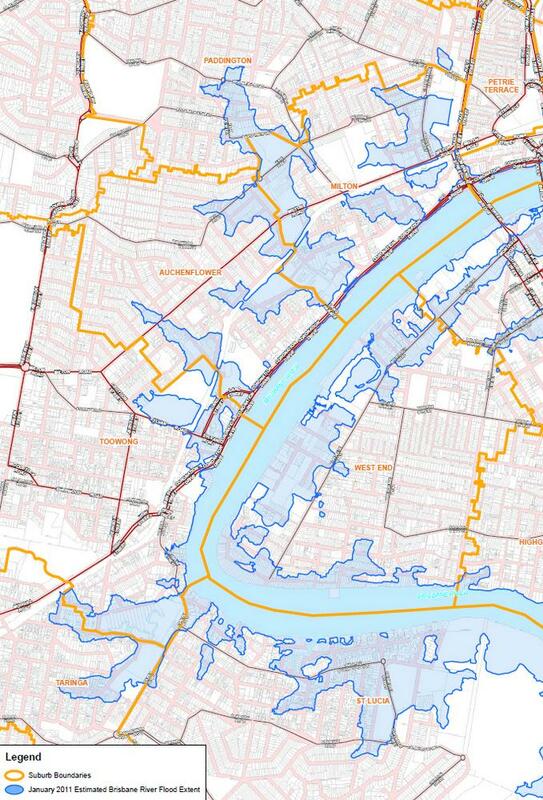 This seems to be confirmed by the extent of the 2011 floodlines shown on the map to the right (cut from one of the Brisbane City Council’s interim flood level maps), which shows that the creeks of the Crescent Reach are very much still with us today. Though the difference is not dramatic, the Western Creek floodline reaches further inland than the two-pronged floodline of Toowong Creek. I live on Perrin Park and cross the little bridge over the creek daily. At high tide all the mangroves are covered with water and you can’t see the bottles and the cans. It’s quite a beautiful creek just there. And it floods. A lot. When the Brisbane River floods, the creek backs up from the River and the water level rises slowly and evenly. But when the creek floods from rain upstream, an interesting thing happens. The creek as seen in the above photo (and in reality) follows a path below the oval, but the Google map shows the creek going straight into the oval. When flood waters from upstream (the left of the photo) first get to the point where they overflow the banks of the creek, the water gushes straight down the line drawn on the Google map, straight into the park. The assumption could be drawn from that, that that is where the water wants to go. So I hope not only does this throw some light on the original course of the creek, but it also explains how you can use the word “that” in a sentence three times consecutively. Lindsay, thanks so much for that info. The picture of the river after the storm is amazing! We listened with great interest on the discussion on Toowong Creek on ABC this morning. My family home was 2 blocks away from the mouth.. At the time there was a boat shed and dry dock.. It was used during WW2. for maintenance.of small ships. We referred to it as Carrs Creek as the Carr family had a dairy farm close by. We were able to row a boat from our pontoon under the bridge.through some distance to Perrin Park. Memories for me but a hope a little insight for those interested in its future. Lynne, that is fascinating! Thanks so much for sharing. And I must check to see if there is a podcast or transcript of that radio discussion. Cheers!